Just days before US Secretary of State Mike Pompeo and top US military officer, General Joseph Dunford are due to meet with Mr Imran Khan, Pakistan’s new Prime Minister, the White House administration is ratcheting up the pressure on the Asian Muslim nation (historically seen as a US ally) by cutting $300m in aid over what it calls Islamabad's failure to take action against militant groups. 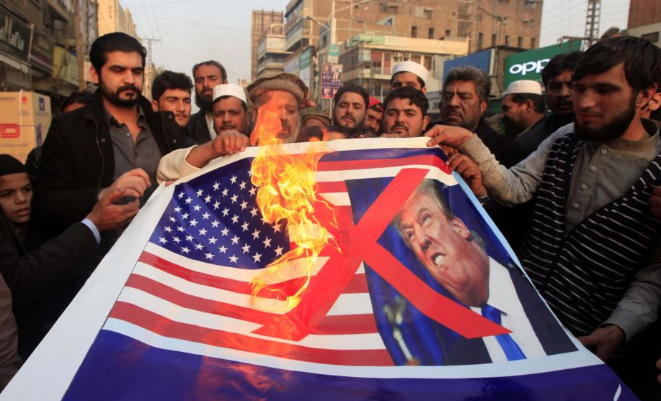 Earlier in the year, before Mr Khan’s election, US President Donald Trump had already repeatedly accused Pakistan of deceiving the US while receiving billions of dollars in aid. Pentagon spokesman Lieutenant Colonel Koné Faulkner explained that the money saved by the US military would now be spent on other "urgent priorities" like aid to veterans. Colonel Faulkner: "We continue to press Pakistan to indiscriminately target all terrorist groups," whilst adding there is "a lack of Pakistani decisive actions" in tackling the terrorist funding issue. Related coverage: <a href="https://thegoldwater.com/news/32904-Pompeo-No-Rationale-For-US-Tax-Dollars-For-Pakistan-s-IMF-Rescue"> Pompeo: “No Rationale For US Tax Dollars” For Pakistan’s IMF Rescue</a>. The US state department claims that Pakistan is aiding the Haqqani network and the Afghan Taliban just as the Pentagon tries to end one of the US’s longest ongoing wars in neighbouring Afghanistan. Mr Sameer Lalwani, co-director of the South Asia program at the Stimson Center think tank in Washington claims that "it is a calibrated, incremental ratcheting up of pressure on Pakistan," analysing that the pressure is probably linked to the expected demand of Pakistan for IMF funding (which is largely supplied by the US taxpayer). "They are squeezing them when they know that they're vulnerable and it is probably a signal about what to expect should Pakistan come to the IMF for a loan." There should be no aid to these countries. They do not share our values. They protect our enemies. WHERE THE HELL DOES 300 MILLION COME FROM IN THE FIRST DAMN PLACE TO GIVE AWAY TO PAKISTAN??? IS IT TAX MONEY??? WHY THE HELL SHOULD ONE THIN DIME FROM AMERICA BE PAID OUT TO OTHER COUNTRIES AT ALL? WHY?? CHARITY BEGINS AT HOME!!! IF WE CAN GIVE 300 MILLION TO THEM AND EVEN MORE TO OTHERS BILLIONS, WHY IS THERE STILL POVERTY IN AMERICA??? As long as we have 1 American CITIZEN needs basics, I would QUIT sending money outside the USA. Secure the Borders, and start telling the world we have quit buying your love. BTW: many of the countries that get US Taxpayer Money waste and abuse major chunks of it. They also slip obscene amounts back into the pockets of certain congress person foundations, causes and Lobbyists that arranged the $$$$$$. Which then recycle the $$$$ into campaigns and Million $$ Board Seat Salaries.